Home » Collections » Exhibitions site now live! Development on our collections continues apace! Following on from the successful launch of collections.ed.ac.uk, we’re delighted to announce https://exhibitions.ed.ac.uk, which showcases displayed items from our current, and past, exhibitions. 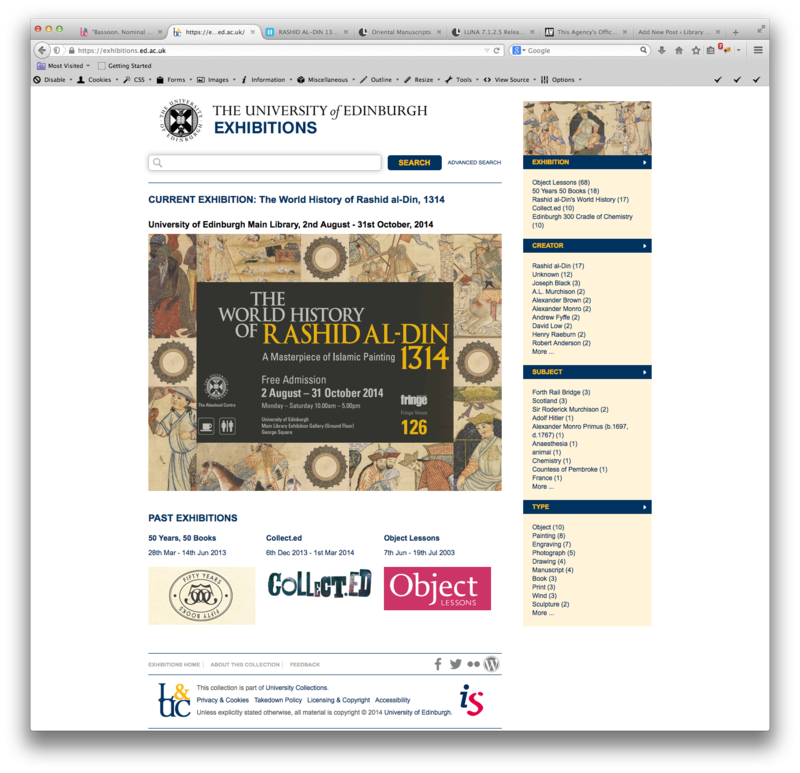 Building on the same technology as collections.ed.ac.uk (Dspace + Skylight), our intention is to make available objects from the current exhibition (in this case Rashid al-din’s World History, which runs till 31st October), coupled with a look and feel which matches the exhibition’s branding. The site follows the collections.ed.ac.uk structure, which allows searching and facet browsing, and supports video and audio where appropriate. Our intention is to relaunch the site in tandem with the physical show each time a new exhibition commences, and henceforth, the new material will be illustrated by photography from the people that we feel do it best: our own Digital Imaging Unit. From a development point of view, we like to think that the relatively quick turnaround of this site shows that the architecture we’re using is flexible and reusable; there are more such sites in the pipeline. As many past exhibitions as possible will be sourced and searchable on the site. Currently, we’ve got data loaded for 50 Years 50 Books (2014), Object Lessons (2003), Collect.ed (2013) and Cradle of Chemistry (2013), with more exhibitions to follow. Watch this space for updates. Thanks to Emma Smith, Gavin Willshaw and the CRC staff in general for helping make this a straightforward and enjoyable process. Postscript! The eagle-eyed (or people with absurdly high-performance memories) among you may recall we launched exhibitions.ed.ac.uk some time ago, for the 50 Years 50 Books show. This was a good interim solution which served that particular exhibition reasonably well, but it was hosted by Google, and there were a number of limitations as to how we could present our material. We knew we could take exhibitions to the next level with the in-house Skylight infrastructure, and that’s what we’ve done, but the Google site is still available from the 50 Years 50 Books homepage, should you be particularly fond of it!